...we offer you all the steps from one hand. Whether concept design, construction, commissioning or servicing of your EnviWaste-plant - we are on your side. With our offer you can use long-term secured regulatory conditions, guaranteed feed-in tariffs for electricity and the possibilities of the liberalized energy markets. An investment in the future of the renewable energies market pays twice: The environmental impact is reduced, the value chain optimized. Many different organic waste materials are well-suited for being used as raw materials for the production of biogas. When used in conjunction with the right technology as high-value substrates, food and restaurant waste, green waste, glycerine, slaughterhouse waste and botanical and animal fat can lead to an impressive income. In this regard, the advantage that residual materials have over other input materials which appear to be equally attractive from an energy-related point of view is the fact that these residues do not require any cultivation areas. Even packaged waste can be used for biogas production following an automatic separation from its casing. It must also be cleaned, in order to ensure that it is harmless (from the point of view of hygiene) and is free of pathogens. Waste fermentation plants are subject to stringent technical requirements, since plastic packages and the like are non-recyclable and must be removed before the fermentation process is carried out. In order to ensure that the raw materials are fermented in the best possible manner, they must be broken down to the highest possible degree. Our patented Kreis-Biogas-Dissolver optimally mixes and shreds the input materials to a fine dimension, thereby increasing the biogas output. Various other mixing devices ensure that substrates of varying consistencies can be fed in. In the heated and air-tight digester, the biomass ferments in conjunction with the production of methane, the so-called biogas. The resultant residual product, i.e. the fermented biomass, can be used instead of expensive mineral fertilisers as a low-odour, natural fertiliser in the agricultural or horticultural sector. The filtration of the fermentation residues can also yield process water. The biogas is incinerated in the combined heat and power plant (CHP), and electricity for which compensation can be obtained is generated. The accruing heat can either be returned to the respective company or fed into the district heating grid. The CHP can be regulated in terms of its utilisation. Consequently, it can correspond to various remuneration regulations and be complemented through other heating concepts. Biogas can be used in a variety of ways: It can be used to produce electricity and heat for private residences, and it can also be used to supply public buildings or the selfsame manufacturing company. Apart from that, biogas can be channelled into the gas grid after it has been processed into biomethane. It can also be utilized as a fuel that may, for example, be used to facilitate motor vehicle transportation or the actuation of in-house motors. 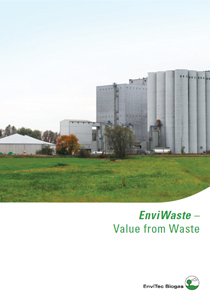 EnviWaste: Our technology and experience – Facilitating successful investments. Smart Investments and innovative concepts– find out more about our industrial reference projects in the global marketplace.